I had the opportunity to spend a day with Hoof Care Practitioner Tim Miller over my holiday break. I spent a week and a half with Tim and his wife Carolyn in southern California and showed them the Easyboot Gloves. We conditioned horse all week when he invited me to go to work with him. 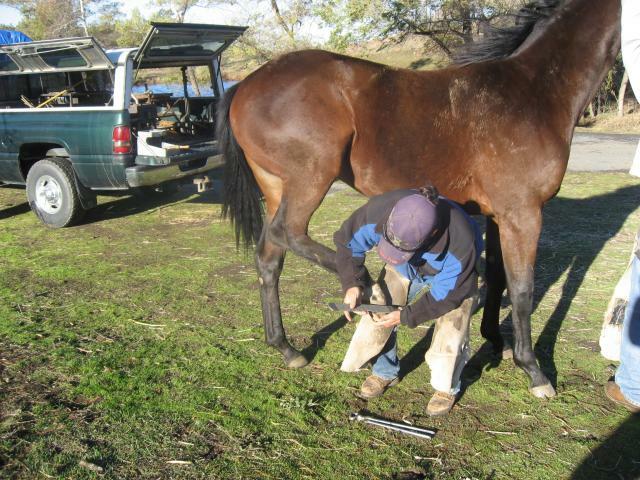 Tim is both a farrier and a barefoot trimmer. I got to accompany him at EA, a large Thoroughbred racing farm not far from their home in Julien. That particular day, we pulled horses shoes so that they could be turned out to pasture for the winter. Many of theses horse were not cooperative but Tim encouraged me under them to get a hands on experience. He talked me through each natural hoof trimming and pointed out different angles and how they help balance the horse. One thing that Tim encouraged was proper positions and how you can actually help the horse cooperate by putting yourself lower to the ground and more centered under the horse. 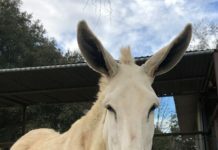 Some of the Thoroughbreds we worked on were old and arthritic and it was amazing how much more they cooperated when they were in more balanced positions. When we got home, Tim talked me through a barefoot trim on my own horse Abe. 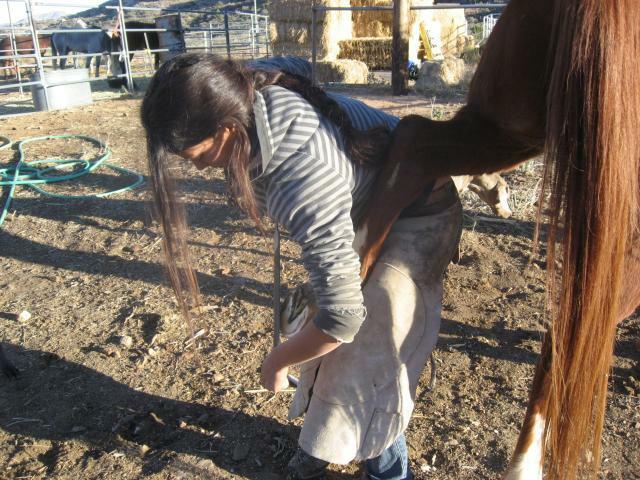 There is nothing like a hands on experience to help you understand each horses feet. I highly recommend getting a hands on feel for your own horse hooves. It will make you understand what makes your horse move the way he does and will give you a whole new appreciation for your trimmer, not to mention it’s a great workout! Thank you Tim for this very insightful day!